No matter where you are, what you’re doing, or who you’re with, there’s always someone in every photo who manages to blink just at the time the photo is taken. There’s always someone with their eyes half shut and it’s always a mixture of hilarity and pure awkwardness. 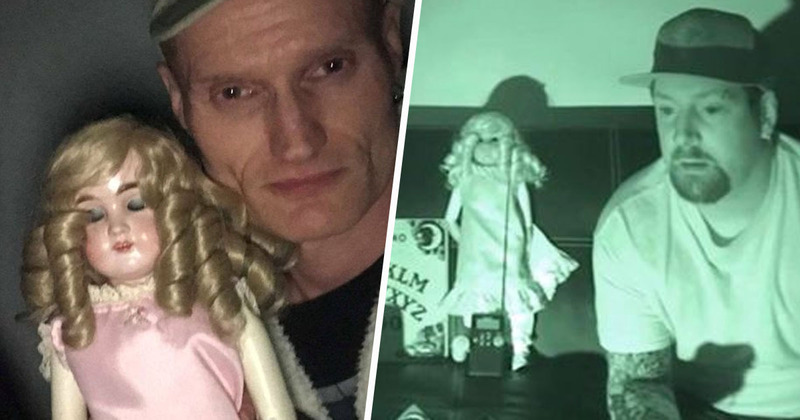 However, when you’re a ghost hunter, and you’re taking a selfie with a 116-year-old doll with no eyes or eyelids, you wouldn’t expect said doll to be the one to blink. That’s what happened to two ghost hunters in Nottinghamshire though, as they explored an abandoned building known as ‘The Village of the Damned’. The happily-titled little town is in Mansfield, and people who visit often claim to feel sick, dizzy, suffer headaches and hear footsteps and voices while there. These experiences come on particularly strongly in the presence of ‘Janet’ – the little doll with no eyes. The doll was originally owned by a family in Texas, who purchased it in 1903. 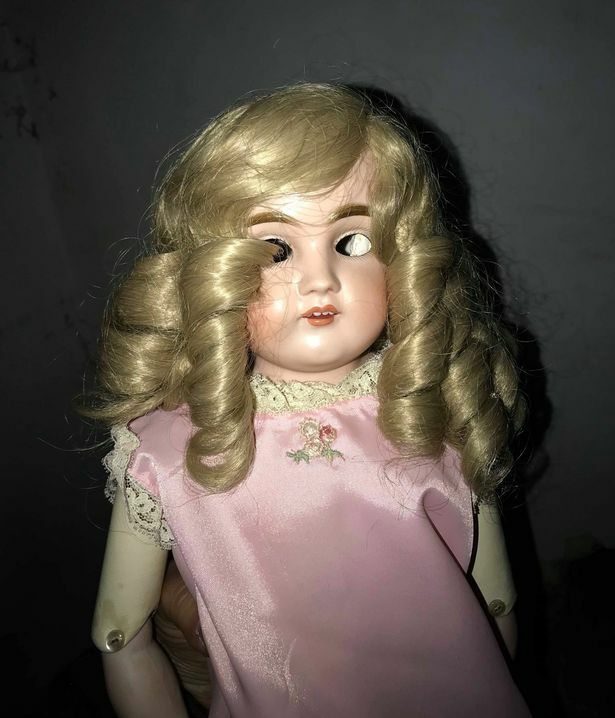 Paranormal investigators, Craig Jones and Matt Wood, who brought the doll to the investigation with them, couldn’t believe what they were seeing after they took the photo. 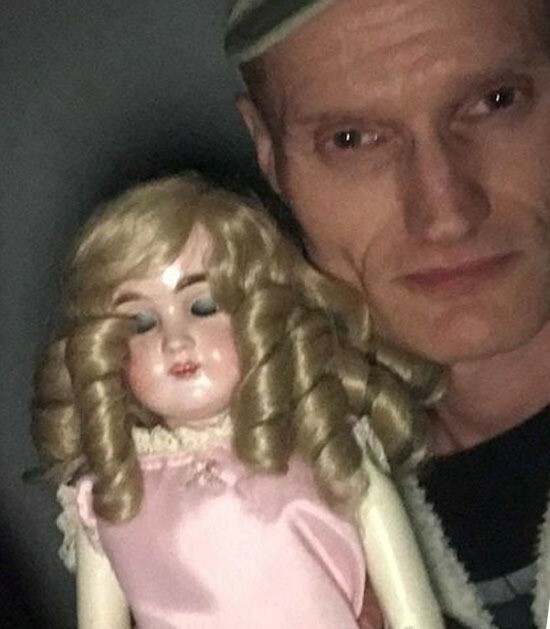 I love haunted objects and actually being on an investigation with a haunted doll is amazing, which is what made me want to get a picture with her. We took a picture with Janet, and as I looked at the picture it looked like her eyes were closed. But then I remembered that she doesn’t have any eyes or eyelids and just has empty sockets, so I turned my torch on to check, as it was dark and I saw that she doesn’t. We were confused and took more photos to try to recreate it, but couldn’t. Then other people then tried but also couldn’t recreate it either. We showed a lot of other people at the event and everyone said that it’s ‘crazy’ and ‘very creepy’. People also said it definitely looks like her eyes are closed and it looks like she has eye lashes and make-up on. Craig and Matt, who post their paranormal investigations on their YouTube series called The Unknown, claim to have no idea what caused Janet to close her eyes. The doll’s owner, Miki York, was given the doll by a woman called Julie, whose great-great-grandmother owned the doll in 1903. Julie and her family intensely disliked the doll, locking it away in the loft due to its creepy aura. However, they also claim to have heard footsteps coming from the loft afterwards.